With the exception of lowly plants like the duckweeds, the flowering plants generally furnish examples of cells of great variety of form and length. Those which become thread-like, but thickened internally, are termed wood cells (fig. 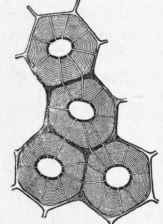 7), but wood fibres when they become pointed at the ends, with the thin portions spliced or overlapping, so as to form continuous masses of wood (fig. 7). The thickening is by no means always uniform, for small spots are left unthickened in pinewood, and such are known as pitted wood cells (fig. 7). The thickening may take the form of single or double spiral bands in the stems of Melons and Cucumbers (fig. 8), ring-like bands, or a mixture of annular and spiral ones (fig. 8). In ferns the bands unite in the form of a ladder. These elongated cells may be placed end to end and the partitions broken down, thus forming continuous vessels, like a hose pipe, for the rapid conveyance of liquids. 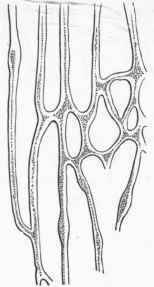 Sieve tubes are formed in the inner bark of stems by the dividing plates of vessels becoming perforated by small openings. Plants with a milky juice, like the Lettuce, Dandelion, and India Rubber, have cells which join in a variety of ways and break down the intervening partitions, becoming continuous and forming what is known as laticiferous tissue (fig. 8). Fig. 6. - Section across Wood Cells, showing concentric layers of woody matter surrounding a central cavity - Scolopendrium. Fig. 6. - Elder Pith, consisting of aggregations of Cells - magnified. Fig. 7. - Wood Cells.